If you have pets, children, or are simply concerned with the use of traditional fertilizers and weed prevention, you may want an organic garden. Let Sunshine Landscapes install an organic garden for you, or convert an existing garden to organic! Our landscape professionals know how to combat weeds and pests with organic solutions, and can enhance or ameliorate your soil with organic compounds, giving you lush, healthy, rapid growing plants. Organic agriculture (or "green landscaping") has a long history, and by following its essential principles you can have a great garden that's safe to walk on, sit on, and  in the case of vegetables  eat! We can install plantings that keep away some predators, attract others (especially birds that love to eat harmful insects), and plants that compliment one another. Organic gardens can include any kind of plantings, including flowers, shrubs, trees, vegetables, herbs, and more. Sunshine Landscapes can set up a garden for you in any style you like, including the following (click any garden type for more information). 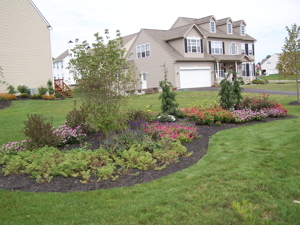 Let us come to your home and show us how personalized garden design can improve your yard. Interested in deer resistant plants? Click here to learn more.